I am a creature of habit when it comes to food. I love my French, creamy deliciousness, but I made an ardent effort in my recent recipe sweep to try a new style. 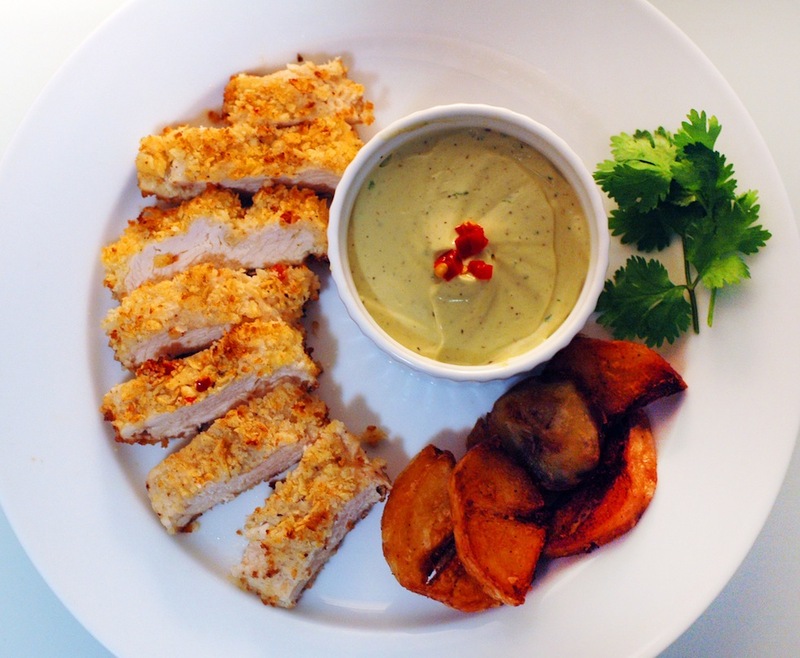 David’s a big fan of Mexican food, so when I came across a recipe for crunchy tortilla and jalapeno breaded chicken with an avocado dip, I thought it would be an excellent vehicle for my culinary taste expansion. The recipe was sourced from a funny recipe book by Julie Albert & Lisa Gnat called Bite Me, loaded with lots of quirky humour and sassy-sounding recipes. Pound chicken breasts with a meat mallet to an even thickness. In a large bowl, combine sour cream, sugar, chili powder, thyme, salt, pepper and garlic. Coat chicken in sour cream mixture, cover to marinate and refrigerate for a couple of hours. Preheat oven to 425 F. In a large bowl, combine panko, tortilla crumbs, cheddar and chopped jalapenos. Take the marinated chicken and coat them in the panko mixture, pressing the mixture into the chicken to ensure it adheres well. Place in ovenproof dish and bake for 20-25 minutes, until cooked through. To prepare the dip, place all the dip ingredients in a food processor and blend until smooth. A few notes during the preparations: I’m not capable of handling much spicier than a few jalapeno chips; however, David takes great pleasure in setting bonfires ablaze in his mouth and stomach. Given our disparate levels of spice tolerance, I opted to add roughly half or even a third of the jalapenos listed and bread my chicken breast, before putting in the rest and breading David’s. I had purchased a small can of “hot” jalapenos, so I’m sure mild jalapenos would also be perfectly acceptable. The breading on the bottom of the chicken breasts was a touch soggy, so for next time, I’ll probably pan-fry a bit first to make both sides crispy before baking. We also grated a bit of cheddar cheese on top of the sliced breasts (which I can never object to). Finally, the dip measurements yield about 2 cups worth, more than enough for our meal, but will make an excellent dip with the leftover tortilla chips we have. On the whole, the dish was delicious. D declared it to be spicy and complicated and interesting, loving the thyme and cumin along with the sweet, creamy avocado and sour cream. D said that it would also be tasty with some salsa on top. Even my pared-down jalapeno breading was firing up the taste buds (milk really is my friend), but I didn’t find it unbearable. Definitely filing away for another round!